Hail to the Redskins…we heard that song so much in the 2nd quarter it was ridiculous!! Somewhere Tony Lilly (#22 Broncos) is still having nightmares. 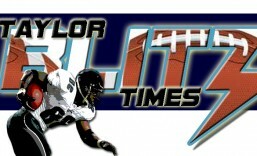 I remember tellin’ my boy Tommy Walker he may never play again in the NFL after this performance. Yet we’re here to celebrate accomplishment. The first Black quarterback to start a Super Bowl was one that carried significant weight for all those that were “coerced” into playing other positions throughout the years. Prejudice kept blacks from playing the thinking positions throughout the 50’s, 60’s,’70’s, & 80’s with the last bastion being that of the quarterback. Now to have Doug Williams about to face media darling John Elway, pundits wondered if Washington could stay on the field with them. To think that we were about to see the greatest offensive performance in the history of the NFL in Super Bowl XXII just didn’t seem plausible. Consider the fact that Doug Williams had begun the season as backup to incumbent Jay Schroeder and the on again, off again, nature of being the 2nd stringer being replaced by the starter. Schroeder had led the Redskins to the 1986 NFC Championship the year before which included a big playoff win over the defending champion Chicago Bears. He couldn’t come up big against the NY Giants in that championship game but neither had any other QB that season. So in ’87 after another Schroeder benching, Gibbs went with Williams as the starter in the playoffs. He played ok when the Redskins beat the Bears 21-17 in Walter Payton & Gary Fencik’s last game. Williams only completed 9 of 19 passes in a lackluster NFC Championship (17-10) win over the Minnesota Vikings. There was still speculation over who would start at quarterback as the Redskins made their way to San Diego for SuperBowl XXII. After going down to Denver 10-0 and Elway’s first pass being a touchdown to Ricky Nattiel, Williams hurt his knee yet came back to start the 2nd quarter. Now get this, the famous Elway drive in Cleveland took a little over 5 minutes the year before. Well in the 2nd qarter of SuperBowl XXII, Doug Williams led Washington’s offense to 356 yds of offense, 5TDs with 4 of them being TD passes in only 18 plays and 5:54 seconds of possession!! Yikes!! Talk about the “Greatest Show on Turf”…to finish the game with 602yds when they clearly stopped trying to score after halftime was ridiculous. Joe Montana, in his win over the Broncos in Super Bowl XXIV, threw for 297 yards and 5 touchdowns in a 55-10 rout. Or to put it to you another way – Of the previous 21 Super Bowls, only 5 of the 42 teams gained more yards in their complete game than the Redskins had in the 2nd quarter alone. Doug Williams most yds passing game 340 and for a half with 306. Ricky Sanders most yards receiving game 193 and for a half with 177. 35 points were most in a quarter and a half of a Super Bowl. Total yardage for a Super Bowl game with 602 yards of offense. This was one quarter we’re talking about!! Steve Foley had been Denver’s safety for many years, retired before the season and was replaced by Tony Lilly. Who spent Super Sunday chasing Redskins into the endzone and was subsequently let go after the game. He did not resign with another team. 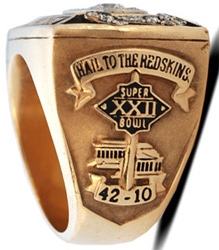 This was the ring for winning SuperBowl XXII and ushered in the era where black quarterbacks were able to gain their due…with the Warren Moon’s & Randall Cunningham’s soon to follow. I can remember my Mom being in tears as we watched and I kept telling her what record had just fallen and which ones were coming up. Try the fact the Washington Redskins are in a battle against Native Americans to keep their team name. What this generation doesn’t know is the Redskins under George Preston Marshall was the last NFL team to integrate. Before 1960, the Redskins were the NFL’s most southern team whose games were broadcast to the south regionally. In fact at their welcome back luncheon to kickoff the season, the Marshall owned Redskins actually sung “Dixie.” Something Hall of Fame Redskin Bobby Mitchell recounted in NFL Films’ Black Star Rising. Now Robert Griffin III sporting dreadlocks is the Washington incumbent starting quarterback. If the Seattle Seahawks win it all here in the next 3 weeks, we’ll have the NFL’s first dynasty with a black quarterback at the helm in Russell Wilson. Life works in mysterious ways…. now you’ve come full circle. This article is dedicated to Doug Williams for his transcendent performance in San Diego in 1988. 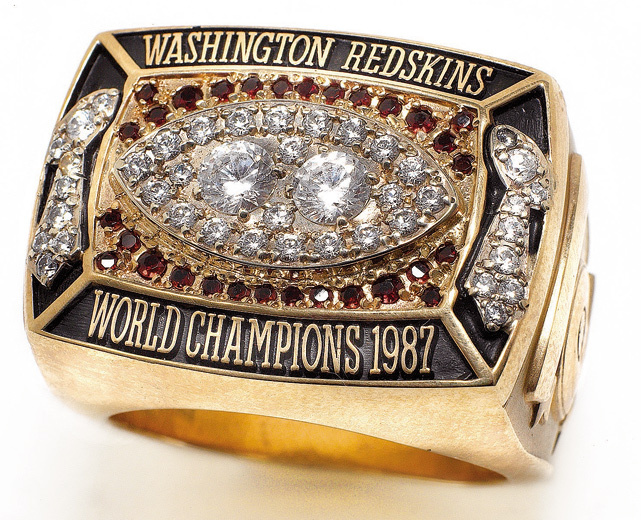 This entry was posted in Ring of Champions and tagged 1987 Washington Redskins, Black History Month, Doug Williams, football, NFL History, Super Bowl Rings, Super Bowl XXII, the first black quarterback to win the Super Bowl, washington redskins. Bookmark the permalink. Remember the game well, Eddie Robinson was in attendance, Doug showed out, I never have liked the Redskins but loved Doug. This was a great Historical Marker. A great article, Thanks for not letting us forget what Doug done that day, and the struggle,that Afro- Americans faced to achieve Glory. Tremendous game… remember my Mom crying while we were watching it.